Spring is coming soon, and as such, lawn care season will soon be in full swing. If you want to have the greenest lawn on the block, you need to get started with lawn care early on in the process. While it can be time consuming, by raking, weeding, and aerating, in conjunction with using a quality locally owned lawncare service in Atlanta, you can create a lawn so green it will blow your mind. 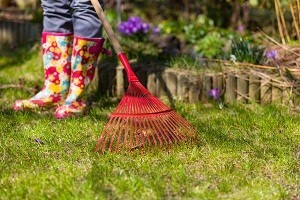 Here are three of the most important spring lawncare chores. Raking is a chore that should not be reserved to just the fall, as the benefits will directly translate in to a better-looking lawn come summertime. It’s not just leftover leaves that will be removed by raking, you will also be able to remove the dead grass that accumulates just over the surface. Over time, the non-blade portions of the grass, that do not easily decompose, become what is known as thatch, and can prevent your grass from being able to reach its full potential. This is because the thatch prevents water and nutrients from efficiently reaching the roots of the grass. Taking a day to rake out the excess mess, will provide you with a head start on getting your lawn in perfect shape. Do you use your Atlanta lawn all year long? If so, great. Lawns were meant to be enjoyed, after all. However, over time, all the extra weight can cause some problems for your lawn. The extra weight causes the soil to become compacted, which makes acquiring nutrients extremely difficult for your grass. If you see moss, this can be a sign of compacted soil, and it should be promptly removed. 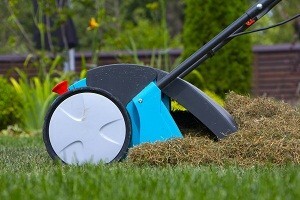 There is a reliable solution to the compaction problem, in the form of lawn aeration. However, Aeration is recommended in the spring for warm season grasses (Bermuda and Zoysia) to reduce compaction; aid the movement of water and nutrients to the root zone; and, increase turf thickness. It is recommended in the fall for cool season grasses (Fescue) along with overseeding to re-establish the turf for the coming year. Crabgrass and other invaders are the bane of just about any homeowner, making a beautiful lawn seem out of reach for many. However, by getting ahead of the invaders on your lawn before they take over, you can avoid many of these problems. If you have just a few weeds, this can be as simple as hand pulling out weeds in early spring. Some weeds, such as Poa Annua quickly spread across your lawn and can cause you additional problems. Even with herbicides, you may still have to monitor weeds in your lawn throughout the summer, but by getting a head start in early spring, you can make your life easier come July. When it comes to lawncare, commitment is often the key. From spring preparations, to summer mowing and winding things down in the fall, it can be a challenge to keep up with lawn care, but by getting ahead of the curve in the spring, you can ensure a beautiful lawn all year long.